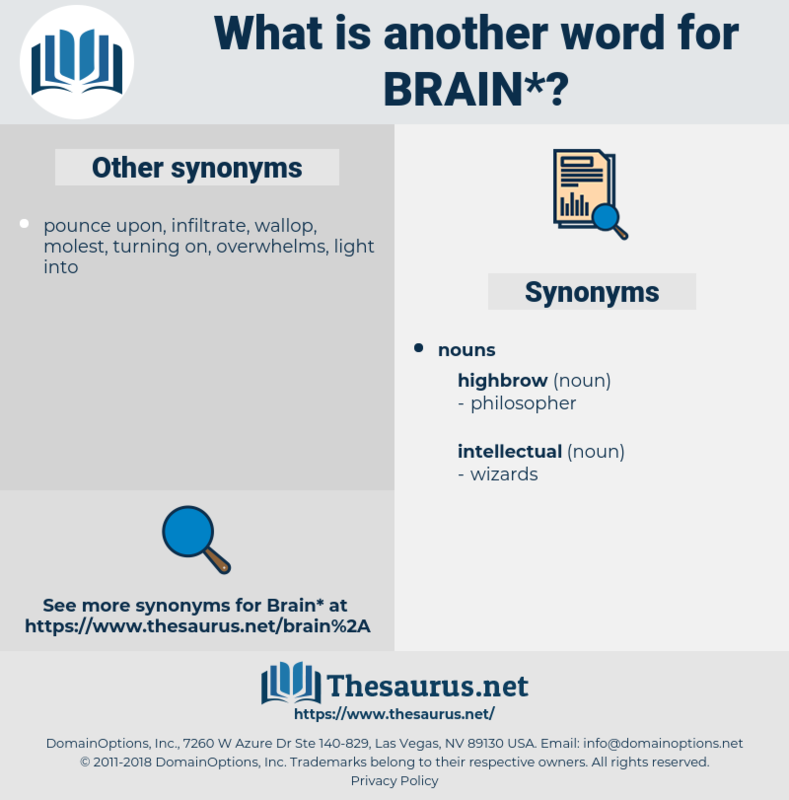 What is another word for brain? [ Latin] That part of the central nervous system contained within the cranial cavity; comprising the cerebrum, cerebellum, pons, and medulla. In the embryo the B. is composed of three vesicles, anterior, middle, and posterior. The anterior vesicle gives off the optic vesicle( which develops into the retina and optic nerve), and then divides into two parts, an anterior( Prosencephalon) and posterior( Thalamencephalon). The Prosencephalon( Fore-brain) forms the cerebral hemispheres( budded off from it as two lateral vesicles, the cavity of which constitutes the lateral ventricles), corpora striata, and olfactory lobes( Rhinencephalon). The floor of the Thalamencephalon or Diencephalon( Interbrain) forms the optic chiasm and infundibulum; its walls the optic thalami; its roof the pineal gland, anterior and posterior commissures, velum interpositum, and chorioid lexus; and its cavity the third ventricle. The floor of the middle vesicle( Mid-brain, Mesencephalon) forms the crus cerebri; its roof the corpora quadrigemina; and its cavity the aqueduct of Sylvius. The posterior vesicle divides into two parts, an anterior( Hindbrain, Metencephalon[ Huxley, G. A. S.], Epencephalon), the floor of which develops into the pons and the roof into the cerebellum; and a posterior( After-brain, Myelencephalon, Metencephalon[ Wilder]), the floor and sides of which form the medulla, and the cavity the fourth ventricle. The B. is composed of a cortex of gray matter( in the cerebrum and cerebellum) ; a series of central ganglia; radiating and longitudinal fibres connecting the cord with the lower ganglia, and these with each other and the cortex; and transverse or commissural fibres connecting one half of the B. with the other. The cortex of the B. is arranged in convolutions and folia, separated by sulci or fissures. See Cerebrum and Cerebellum. The commissural fibres comprise the corpus callosum, anterior and posterior commissure bridging the third ventricle, and the fornix, all of which connect the two cerebral hemispheres; the middle peduncles of the cerebellum, which in part serve to connect the two cerebellar hemispheres; and decussating fibres in the medulla and pons. The longitudinal fibres and ganglia comprise five systems: ( 1) The pedal system includes the pyramidal tract starting from the parietal cortex, the anterior cortical fibres from the frontal cortex, the posterior cortical fibres from the temporal and occipital cortex, and the caudate and part of the lenticular nucleus with the fibres descending from them; these fibres all pass through the internal capsule and pes of the crus cerebri into the pons, where all terminate except the pyramidal tract, which passes down to form the anterior pyramids of the medulla, and is continuous with the pyramidal tract or the cord. ( 2) The tegmental system includes the optic thalamus, with radiating fibres connecting it with the cortex, the longitudinal fibres of the tegmentum of the crus cerebri with the imbedded nuclei( red nucleus, substantia nigra, corpus subthalamicum), the tegmentum of the pons with the locus caeruleus, fibres connecting the tegmentum with the cortex, the superior peduncle of the cerebellum connecting the cerebellum with the tegmentum, the fillet connecting the nucleus gracilis and nucleus cuneatus of the medulla with the tegmentum, the longitudinal posterior bundle of the pons, the brachia of the corpora quadrigemina and the reticular formation of the medulla. ( 3) The system of central( ventricular) gray matter comprises the gray matter lining the ventricles, including the nuclei of the cranial nerves( adjoining the fourth ventricle) and the tuber cinereum on the floor of the third ventricle. ( 4) The system of outlying cerebral ganglia comprises the corpora quadrigemina and the external and internal geniculate bodies. ( 5) The cerebellar system comprises the nuclei of the cerebellum( corpus aeutatum, emboliform nucleus, roof-nucleus, etc. ), with the cerebellar tracts( inferior peduncles of the cerebellum or restiforra bodies, connected below with the olivary bodies and nucleus gracilis and cuneatus, and with the cerebellar tract and posterior median and external posterior columns of the cord). The functions of the B. are: The evolution of all intellectual processes and of the emotions( cerebral cortex), the reception and conscious appreciation of sensations( nerve-nuclei, corpora quadrigemina, tegmental system, occipital and temporo-sphenoidal cortex), the initiation of voluntary motions, including speech( parieto-frontal cortex. or motor area, in connection with pyramidal tract), production and regulation of body-heat( caudate nucleus, tuber cinereum), regulation of vaso-motor action( tuber cinereum, medulla), maintenance of respiration( medulla), inhibition of heart’s action( medulla), initiation and maintenance of the acts of deglutition and vomiting( medulla), acceleration and inhibition of various visceral operations( cerebral cortex), co-ordination of complicated movements( cerebellum). Weight of b., 50 oz. avoird. ( male), 44 oz. ( female) ; ranging between 30 and 64 oz. In structure it is composed of gray matter( cortex, ganglia, lining of ventricles) consisting of nerve-cells with connecting fibres; and of white matter( longitudinal and commissural fibres) consisting of medullated nerve-fibres. The nerve-cells receive, store up, and manufacture, and the nerve-fibres transmit, nervous energy and impulses. 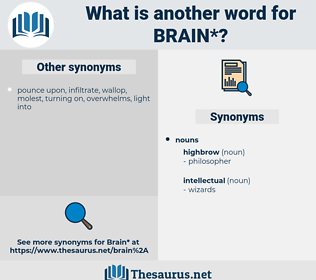 The B. is covered by its membranes or meninges, comprising the pia mater, which covers it closely, the serous membrane( arachnoid), and the external fibrous membrane or dura mater. The arachnoid bridges over the large fissures of the b., leaving spaces( subarachnoid spaces) filled with cerehro-spinal fluid. The ventricles of the b., which are continuous with each other, with the central canal of the cord, and with the subarachnoid spaces, are lined with a layer of glial cells( ependyma) and are filled with cerebro-spinal fluid. Railway b., see Railway. Vertebrae, Capita, hemorrhage, nerve, spirit, intellectual, handler, outflow. e-brain, mastermind, encephalitis, flight, skull, Absconding, spillage, intellect, talent, out-migration. fatuity, knucklehead, philistine, nitwit, fathead, creep, donkey, dolt, churl, clown, foolishness, jerk, blockhead, dopiness, idiocy, denseness, fool, simpleness, cretin, senselessness, imbecile, matter, brawn, beast, lout, half-wit, cur, imbecility, snake, illiterate, doltishness, hammerhead, slowness, feeblemindedness, moron, cad, density, boor, numskull, dodo, dummy, anti-intellectual, pinhead, dumbbell, dumbness, louse, stinker, lowbrow, goon, heel, skunk, stupidity, body, dullness, ignoramus. I can hardly realize it, he said, in a man of your brain. There you have all that, is in my brain - the whole plan. cns, Systema Nervosum Centrale, central nervous system, head, caput. brainstem, brain cell, prosencephalon, forebrain, communicating artery, neencephalon, hindbrain, Arteria Communicans, rhombencephalon, ventricle, brain stem, neoencephalon, midbrain, brain-stem, Circle Of Willis, mesencephalon.